With specialized shipping and logistics needs, trade shows require careful planning. It can be very challenging to plan out a timeline for a trade show, especially since there are so many items that need to be shipped ahead of time. With brochures, promotional items, demos, and the booth itself to think about, it is critical to start planning the shipping and logistics of your next trade show ahead of time. Partner with an experienced logistics provider like AFP Expo Logistics and use these guidelines to help you prepare for your next trade show. 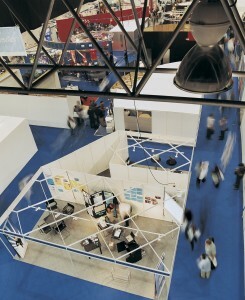 Six months before the trade show is the ideal time to begin the planning process. Set your objective for it and review your results from last year. Set your budget based on the financial state of your company and what worked last time out. At this point, it’s time to start choosing the staffers for your booth and planning its construction. Start researching any deadlines that may be set for discounted rates and services and figure out which promotions your company will run before and during the trade show in order to generate sales leads. Two months before your next trade show, order any promotional items and uniforms you may need for the show. It’s critical to do this early and not wait until the last minute. This is the golden time to have your experienced logistics provider begin shipping out all of your necessary items. Your booth and other exhibit items should be shipped at this time to the advanced warehouse – this ensures that these items arrive on time and that you save some money from not having to use expedited shipping methods. Start shipping out other supplies such as stationary, snacks, and water bottles which your staffers may need about two weeks before the trade show. Consider using online tracking services so you can see exactly where your important shipments are at any time. If you have a lot of shipments or a big one, consider using an FTL shipping service: this allows you the greatest flexibility with time and location. Ensure your shipments arrive before move-in day – some shows charge a fee for shipments that arrive on or after the designated move-in day. Send everything early. It’s always better for your items to arrive early than late. Create a timeline for important dates and cut-offs so you always have a clear idea of your deadlines. This entry was posted on Thursday, April 20th, 2017	at 4:17 pm	and is filed under AFP Expo, Trade Shows	. You can follow any responses to this entry through the RSS 2.0	feed. Both comments and pings are currently closed.